After. 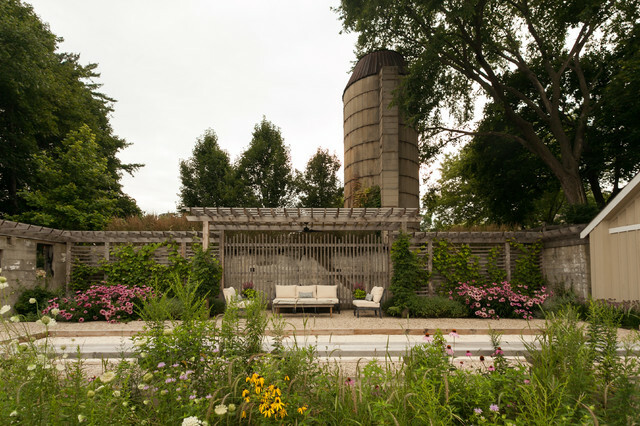 The Mosers worked with the Greenhaven Landscapes team to redesign and rebuild the space, creating a garden within the remaining walls of the dairy. “We tried to work with and showcase what was left of the existing dairy barn structure as much as possible to honor the history of the farm,” says designer Jennifer Hoxsie. The Greenhaven Landscapes team also added a bocce court and covered seating area, built trellises to support vines along the reinforced walls and rebuilt the falling-down wooden shed. The existing concrete grain silo still stands in the background. Use 1x2 slats for our back patio, top & west side? have back of "arbor room" solid, but give fence behind it some openings to allow wind -- if needed can remove some boards/add some gaps.